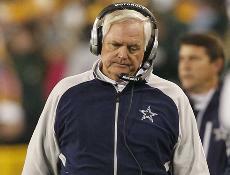 Jones called the loss to Green Bay a "setback". A setback is when you lose your keys and can't go to the gym, or when you spill coffee on your pants before a meeting or even when you fumble the ball in the snow and MIami recovers and scores a touchdown. Let's call this what it really is... a stinking DISASTER! Dallas Cowboys owner Jerry Jones vowed changes on Sunday night after his team fell to 1-7 following a 45-7 loss in Green Bay. Jones, who has consistently expressed shock each week recently as his team has fallen further out of the playoff hunt, did not indicate that anyone would be safe. "There are a lot of people here who are certainly going to suffer and suffer consequences," Jones said, via ESPN. "I'm talking about within the team -- players, coaches who have got careers. This is certainly a setback." The Cowboys entered the season as a team many analysts saw as a Super Bowl contender. And Jones admitted those aspirations have made the fall to 1-7 especially sour. The owner, who said as recently as Friday that coach Wade Phillips would remain in place all season, held off specifically targeting Phillips' job after the loss to the Packers. "We have so many things that we need to correct and address, as this game so vividly exposed and previous games have," Jones said. "I've got a lot of work to do, got a lot of decisions to make. "And it's not just one, two, three or four. There are several decisions. I think everybody in this country would agree that there's a lot wrong with this team that we've got to address, and I'm certainly the one to address it." Older PostSeize the Persuasive Moment after "Thank You"